3. InAEA meeting in Real Life at NAEA! Let’s meet at 8:00 pm on April 16th (Fri) at Hilton Lobby Bar. We could use our SL names to meet, and InAEA could be our password! The related detail will post in InAEA website and FaceBook in April, stay tune! What do you think is art in SL? How you define art in the virtual world? The whole SL interface is art, the building, creating textures, it's like Adobe Illustrator + 3-d world. Our individual aesthetic would remain. You experience it via a different avenue. SL is a way to get to visual issues. The user who build in SL is an RL artist, not necessarily make the SL building become an art. the notion of art - or esthetic experience comes from within - thus it is different for everybody. There are necessarily esthetic-related decisions that go into most of what is built in SL. Quality of built is also important as idea. Does it have anything to do with the relationship of to what degree something is designed for functionality vs. a more primarily aesthetic experience? i FEEL art. I respond to this as art. it isn't so mush an analytical thought process. Is there any object with function, and we can still call it as art in SL? Do you think scripting can be art? Do you think because of the difficulty of modify the land in SL, can “land art” be seen as art? I think this one is art. This is purely based on my aesthetic appeal to what i'm being shown. not really the background behind it but whether or not i think it is "beautiful." What about the unfettered art that kids do? it can be really awesome. but i doubt the kids have a conscious intent or are thoughtfully aware of the artistic qualities. i think these questions all should come back to the definition of art. so RL and sl do have too much difference. its hard to define art, sometimes it doesn't deal with "the artist's" intention at all, but rather what the perceiver thinks. People say "Art is in the eye of the beholder." Do we "need" to define art? it doesn't matter to me. i love to look at all kinds of stuff . VCAE (visual culture art education) is not really trying to define art, but try to understand the VC around us... and make VC to communicate with others. but it does challenge the precept of what art might be. Who is the artist? Photographer? Avatar? The person who made the avatar skin? The person who made the outfit? The person who made the pose? The person who made the environment? Or the person who Photoshop the image? we can see this as a collaboration, but the person who put all this together can be the artist. so, only SL photographer is the artist? Do your answers change when instead of talking about the aesthetics of art, instead you are asking about who owns the intellectual property? ownership and appropriation are very difficult and interesting questions. I think it might change the answer....like in RL there are artists that create art from found objects but they don't own the copyright on them. "hair by...., skin by ...., clothes by......, pose by ......"
When you are there, you may think about “is this art?” or “what does art mean in SL?” and we can continue this discussion on Facebook discussion! 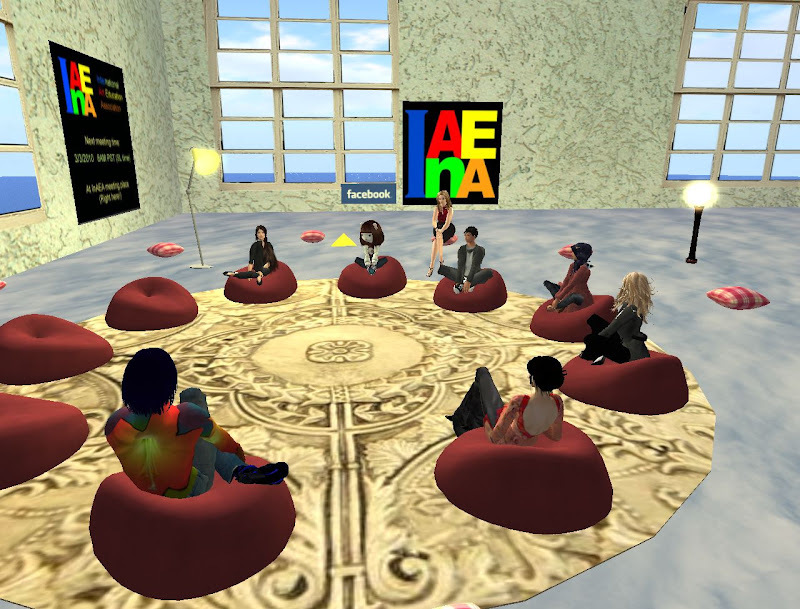 Next meeting time: April 7, 8 AM SL time= 8AM PDT, 9AM MDT, 10 AM CDT, 11 AM EDT. If you would like to lead or suggest our next month discussion, please feel free to let me know.